Zulfikar Hirji, an associate professor in the Department Anthropology in the Faculty of Liberal Arts and Professional Studies at York University, has co-authored a new accessible and illustrated account of Islamic history. The book provides an introduction to a faith that is practised today by more than one billion people whose traditions and civilizations are rich and diverse. 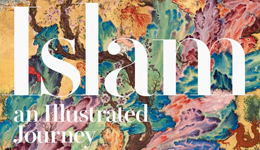 Islam: An Illustrated Journey, co-authored with Farhad Daftary (Institute of Ismaili Studies, London, U.K.), takes readers through more than 1,400 years of history from Islam’s formative era in late antiquity to its place in the modern world. It covers the diverse social and cultural institutions that Muslims have built and through which they have expressed their beliefs and ideas, as well as the numerous artists, intellectuals and personalities, both men and women, who have contributed to Islam’s story. The authors imagined the book as both a travelogue and a history book, and included maps, charts and more than 250 colour images. “We wanted audiences not only to read about Islam’s history, we wanted to provide them with spectacular images to see the many social, cultural and geographical landscapes of Arabia, the Mediterranean, the Middle East, North Africa, sub-Saharan Africa, South Asia, Southeast Asia, Central Asia, China, Europe and the Americas where Islam was adopted and took root,” said Hirji. This book is the authors’ second collaboration. Their first book, The Ismailis: An Illustrated History (2010), provided an account of a single Shi’a Muslim community within the scope of Islamic and world history.